Are you worried about the risk involved with updating your Acer N35 GPS PDA system ROM / Firmware to the latest version and turning it into a stylish silver brick? Well if so this service is for you. 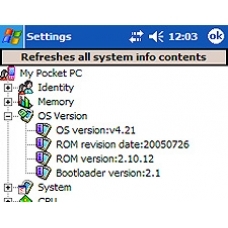 The N35 GPS PDA will be updated to the latest version of the Pocket PC OS available for the unit, your bootloader will also be updated to the most current available. This is an in-house Acer repair service, when ordering this service you are required to ship the Pocket PC into our repair centre for works to be undertaken.